The technique of engraving an image in end-grained hardwoods for relief printing is called wood engraving. It differs from technique of woodcuts in that the wood is worked across the grain, rather than parallel to it as in a woodcut. Tools similar to and including those used in metal engraving are used. The technique allows for almost unlimited texture and very fine detail on a wide range of printing blocks, manufactured from primarily hardwoods such as boxwood, lemon wood, and maple. Blocks made of a synthetic resin under the trade name Resingrave have become available in recent years, and offer an alternative to the increasingly expensive hardwoods. Detail from The Miracle of St. Mark by Tintoretto, an original wood block engraved in 1892 by Timothy Cole (1852-1931). 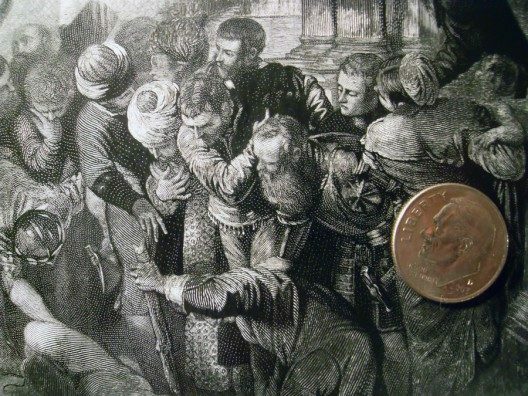 The dime gives the viewer a sense of the minute detail achieved by a master wood-engraver of the time. 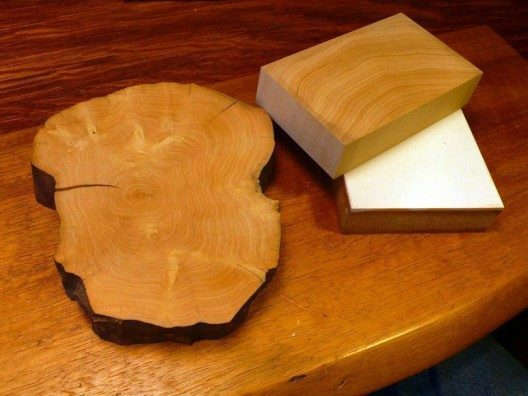 Selection of blocks suitable for wood engraving, from left to right, boxwood slab, lemonwood block, and Resingrave. The blocks used today are made from endgrain hardwood, most often maple, occasionally lemon or boxwood, carefully prepared to the proper printing height (.918”) and with a polished working face. The woods chosen by the blockmaker are specifically close- grained with narrow growth rings to allow for the engraving of consistent fine lines and small details. The surface of the block must be sealed and absolutely smooth for the application of ink. Hardwood trees grow very slowly in certain parts of the world and supplies of these woods are often difficult to procure. The supply of suitable wood and the length of time needed to season and prepare blocks make the blocks more expensive than the plank-grained blocks that are suitable for woodcuts. Blocks made of a synthetic resin under the trade name Resingrave have become available in recent years, and offer an alternative to the increasingly expensive hardwoods. Other plastics such as Corian have also been used. 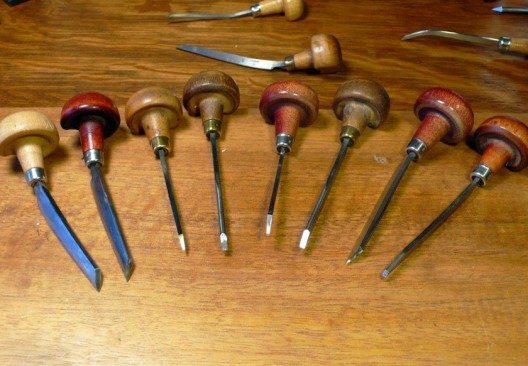 Wood-engraving tools developed from hand-tools used to engrave metal. They also differ in design from chisels and v-tools employed in woodcuts. All tools are available in a selection of sizes to produce the correct width of cut as needed without markedly increasing the depth of the cut. The tool shaft is a length of hardened steel terminated by a variety of shapes sharpened and polished at an angle across the face, with a razor sharp along the cutting edge of each face. Elliptic tint tools, or spitstickers have slightly rounded sides, and are especially suited to curved and undulating lines. Angle tint tools were designed for producing straight lines of consistent width and depth. Round gravers, or scorpers have an almost gouge like face for clearing wider areas, except that they are not hollowed like conventional gouges. There are also specialty tools, such as multiple line tools designed to cut a row of uniform parallel lines, and stippling tools designed to a stipple effect. Some engravers use broad, flat tools called chasers to smooth the cut lines outside of the image area. Other metal engraving tools can be used, but those listed above were adapted specifically for wood-engraving. The metal part of the tool is shaped and hardened, often with a curve bent into the tool to prevent bruising during the engraving process. It is mounted in a mushroom shaped handle with a flat bottom and is intended to rest comfortably in the palm of the hand with the working end protruding slightly ahead of the thumb (which is used as a guide on the surface of the block). The tools are better functioning if fitted to the engravers hand properly by modifying the length of the tool as needed, either by cutting down the working end of the tool, or by shortening the tang. Properly used, the tool is guided through the wood using the heel of the hand to hold the tool, and the thumb as a stationary point. By using a number of small, short cuts with the tool re-entering the cut line in a process called ‘stitching’, quite a bit of speed and accuracy can be developed by the engraver. The tools must be kept absolutely sharp to work and must be honed on an oil or water stone, and sharpened carefully during use. Dozens of wood-engraving manuals were published during the more popular periods of the art, and much can be learned from them. 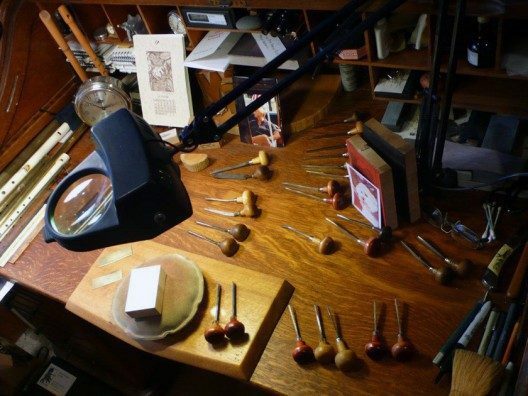 If possible, classes with a practicing wood-engraver are desirable to learn the basic ways of handling a tool. Another useful tool is a small sand-filled bag made from two circles of leather stitched together for elevating and supporting the block, which gives the engraver the ability to freely position and turn the block during cutting. 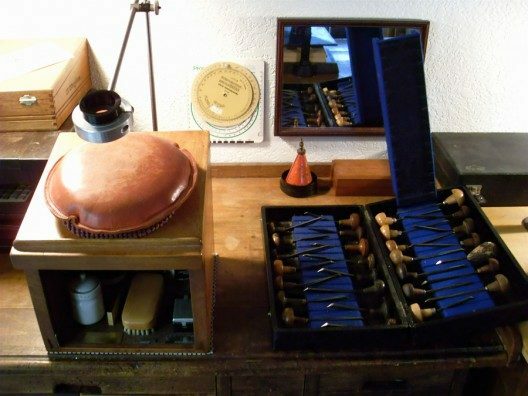 A small angled stand or a pile of books can be used to elevate the block and sand-bag which helps to improve the graver’s back posture while engraving. A magnifying glass on a stand or visor is often recommended for engraving fine detail. A wood-engraver’s working tools, including a stand magnifier, sand-bag and wooden stand, and a box of assorted sizes of vintage gravers. In the back is a sharpening stone and oil can. Wood engraving lends itself especially well to highly detailed images with a wide range of textures. The dense material of the finest boxwood engraving blocks will support the cutting of almost hair-thin line work. The simplest method of preparing an image on the block is to draw directly on the wood surface with pencil or fine-tipped marking pen, bearing in mind the resulting image will be reversed when printed. When using pencil a spray fixative should be used over the image. When using a pen be careful to find a suitable pen that will not rub off while engraving. The simplest method of transfer is to draw the image to size using a medium lead pencil using a sheet of high-quality vellum tracing paper. The sheet can then be turned drawing-side down onto the surface of the block and fixed into position with masking tape. The pencilled image as seen through the tracing paper can then be burnished with a burnishing tool or a bone folder to transfer the pencilled lines onto the surface of the block. Care must be used to not apply too much pressure so as to damage the block, but enough pressure applied to transfer the pencilled lines. If the sheet is allowed to remain taped to one side of the block, the sheet can be lifted to check for progress, and re-attached when needed. After the image is transferred it can be re-drawn using a fine- tipped marker or can be fixed using a spray fixative. Materials required for the next method are carbon paper or graphite transfer paper, and a copy of the image reversed for printing, sized for the block to be used. The carbon paper or graphite paper is sandwiched, face down, between the drawing and the wood surface and a ballpoint pen or other stylus is used to trace the drawing. The resulting pressure will transfer a copy in carbon or graphite to the surface. Too much pressure can cause undesirable denting of the block. The drawing to be traced should be reversed rather than right reading. The resulting line transfer should be re-drawn with a marking pen or fixed with a spray fixative to prevent it from wiping off during carving. The toner transfer method is technically complicated, but yields very fidelitous results, important if the image has a high level of detail. This technique of image transfer to the block requires the use of a heated transfer tool, a photocopy and mineral spirits.This method should only be used in a properly ventilated and fire safe environment. The transfer tool is hot enough to cause severe burns and must be kept under observation during use. Mineral spirits are flammable and should be stored and applied in an area away from the area where the transfer tool is set up to be used for the procedure. Heat transfer tool not greater than 18w capacity. These are available widely in stores selling wood carving tools and most craft stores. Higher wattage tools will scorch the wood immediately and cannot be used. Photocopy made on a non-fusing oil or dry toner type copier of the ‘right reading’ and properly sized image for the intended block. The fresher the copy the easier the toner will transfer. Photocopy is placed face down, aligned properly and secured to the block with tape. A cotton ball, cotton makeup applicator or clean cloth is wetted with a small amount of odorless mineral spirits and rubbed over the entire image area of the photocopy until the paper is just wetted enough to be translucent, no liquid is apparent. Fully heated transfer tool is worked over the paper surface in the image area. wisps of pale smoke may rise from the surface, keep the tool firmly and flatly pressed to the surface and constantly moving, paper should dry, become opaque again and stiffen as you work, this is a good indication you have heated the area adequately. If the paper begins to discolor you have overheated that area. Continue working until the image is completely transferred. Warnings: Synthetic material should definitely be tested for suitably on a piece of test or scrap to find out if the material can withstand the high heat. Even the material withstands heat acceptably pausing in one area too long may cause scorching, keep tool in constant motion. Tool will cool during the image transfer process; working methodically in small areas with occasional pauses to allow the tool to recover proper operating temperature will give the best results. Once the image has been transferred, staining the block with a thin application of a contrasting transparent ink color (red, blue etc,) rubbed into the surface will help to delineate worked and unworked areas and the block is engraved. 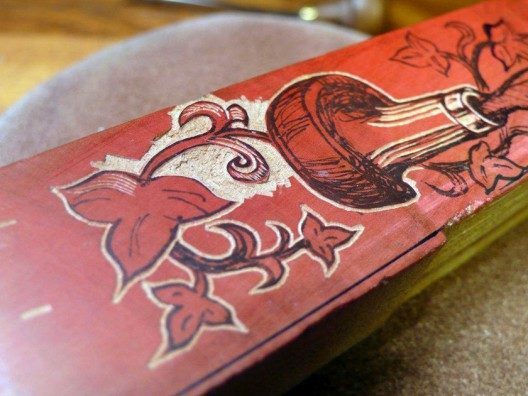 This is especially important in wood engraving as the fine lines and detail can be difficult to see while working. A fine chalk or talc can be used while engraving to see the contrasting lines, but must be completely removed before proofing. The technique of wood-engraving involves the engraver pushing the tools into and along the block’s surface, removing a furrow of material in front of the tool. Line width and character can be manipulated by altering the depth of the tool as it is worked into the surface as well as selecting larger or smaller gravers. The dense material can retain exquisite levels of detail, but this property can also be frustrating to beginners who are not familiar with their tools. Practice with less expensive materials is recommended. The block is positioned on a lead shot or sand filled leather bag on the work table while being worked, one hand holding and turning the block, the other hand controls the graver. The image areas are defined and details engraved using: elliptic tint tools (also called spitstickers), angle tint tools, lozenge gravers (primarily used for metal engraving), multiple line tools, and round gravers (called scorpers). Other tools can be used to create indentations or cuts, such as needles, nails, and electric engraving tools, but the traditional tools should be considered the primary tools with which to work. Non-printing areas are cleared with round gravers or scorpers. Rubbing a fine chalk or talc into the cut lines can help the engraver to see the progress while cutting. The block may be proofed from time to time by using a burnishing tool to take a hand rubbed proof, or it can be proofed with a proofing or printing press. Extreme close up of engraving in early stages. The dense, nearly homogenous nature of the wood used in engraving is evident. It is this quality that allows for the development of hairline detail. Once the image is developed to satisfaction, the block is wiped clean, all debris removed with a soft bristled brush, and the height of the block checked and shimmed as needed to bring it up to type-high (.918). The block may then be locked up in a chase or if using a flatbed press secured with magnets. 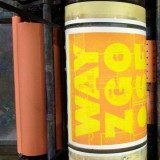 A stiff ink manufactured for letterpress printing is then rolled onto the surface of the block, using care not to apply too much ink, then laying a sheet of paper onto the block, or using one of many forms of registration the impression should be carefully applied. Once printed, the blocks should be wiped clean, using a solvent like Kerosene, Mineral Spirits, or Naptha. A soft brush should be used to clean any plugged-up areas, and a soft cloth or rag should be used to wipe up any excess. Store blocks away from direct sunlight in a cool dry spot, standing on edge to allow air to circulate around the block.